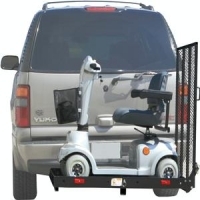 The SC400 wheelchair carrier works great as a scooter carrier or may be used with lawn and garden equipment such as tillers, snowblowers, mowers, or general cargo. Designed to work with Class III or IV trailer hitches. For securing your wheelchair, scooter or cargo, 11 built-in tie-down points have been added along the sides. The hitch cargo carrier’s heavy duty steel construction has a black powder coat finish to give it a sleek look and protect it from rusting. Included with every SC400 cargo carrier is an anti-wobble hitch collar. Hitch Height: 11" to 14"
Platform Size - Length: 46 in.